Heroes are all around us. They are ordinary people who do extraordinary things. Unsung heroes committed to helping others without expectation of reward. These are the citizens for which the Jefferson Awards were created. The Pittsburgh Post-Gazette, Highmark, BNY Mellon, The Heinz Endowments and The Pittsburgh Foundation invite you to nominate an outstanding individual or group of volunteers for the Jefferson Awards. Your nomination can be taken online. It's simple. Just tell us all about the person, family or team of volunteers that you would like to recognize for outstanding service to the community. Your description should be as specific as possible and include the number of hours your nominee volunteers per month, a description of their efforts, their impact on the community and the name(s) of the organization(s) for which your nominee volunteers. Your description only needs to be about 300 words. 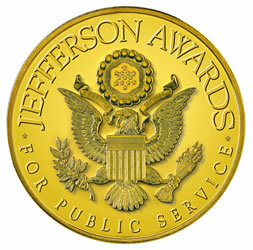 Learn more about Pittsburgh�s Jefferson Awards program.